Last January I was invited by Cunard Cruise Line to sail aboard the Queen Elizabeth from Acapulco, Mexico to Los Angeles. As it was the dead of winter and I was in Wisconsin, it sounded like a great deal. I’m not a big cruise guy. I had only taken one previous cruise and that had been more than a year ago. What my previous cruise experience taught me is that even though I’m probably not the prime target audience for a cruise, I didn’t dislike cruising. I came in assuming it would be nothing but buffets and fat, drunk people. I came away having had some very high quality meals and didn’t see anything of the party atmosphere I had expected. So when the opportunity came again to sail aboard the Queen Elizabeth, I said yes. I figured it would be an interesting five days. 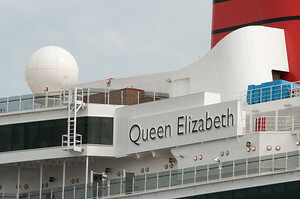 This was the maiden voyage of the Queen Elizabeth. They were less than one month into a 108 day around the world cruise. This really piqued my interest because I had never really paid any attention to long term cruising. I had always just assumed that cruise ships just did voyages around a week in length. A 108 day circumnavigation of the globe was another thing entirely. Having been around the world a few times myself, I became interested in the idea of doing it on a ship. That is a whole lot to cram into a little over three months! It isn’t cheap, but it can be more affordable than you might think. The cheapest ticket I found for the Queen Elizabeth’s around the world trip was $19,995. That is a lot of money, but when you factor it over 108 days, it averages out to around $185/day which includes your room, transportation around the world and all your meals on the ship. I’m not sure it is possible to visit that many places at the same level of luxury if you did it on your own. Also, most of the people on board were not doing the entire trip. They would only do a segment. I believe around 800 people out of 2,000 on the ship were doing the full tour. Prices on other cruise lines for similar trips range from $14,292 to a whopping $279,895. Prices do not include drinks on board the ship nor does it include expenses incurred while in port. While you can find lower cost trips, this probably isn’t something you want to do if you are a budget traveler. Most of the passengers were rather old. The average age of the ship’s passengers was well into the 60’s. This really isn’t surprising. If you are retired and still have a knack for adventure, and especially if you have saved some money, then this might be the best option for you to see the world. I met several people who were well into their 80’s who were doing the entire trip. 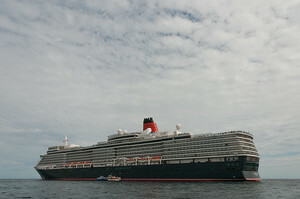 Cruises tend to attract an older demographic and for a luxury line like Cunard, it is especially true. You have to trade quantity for quality. Taking a trip like this will let you see many of the great cities of the world in a rather short period of time. However, you will only get to spend a few hours in each city or have one shore excursion. That is the tradeoff of all cruise ships. If you don’t have an entire year to spend traveling around the world or can’t easily travel for physical reasons, this might very well be a sacrifice worth making. I will not recommend taking a trip around the world by cruise ship for everyone, but it is at least something I’d consider depending on your position. If you have the money and/or have difficulty traveling, then this might be a good option for seeing the world. It is a type of travel which is primarily targeted to older people. I could totally see myself doing this if I was 80 years old and had difficulty getting around. You only gave the cheapest price. What’s the most expensive? In between? Something where I can look out at the ocean. I am trying to decide if I should jump on an opportunity that has come my way or pass it for something else. I am an avid traveller and I have done a good amount of tavelling. Just got back after a month long trip to Turkey and France. I like to experience different cultures, have travelled solo mostly to Asian countries and love to spend time and get to know a place. I have an oppurtunity to go on a world cruise on a Cunard ship with my uncle and aunt next year. I will be able to join them for a fraction of the regular cost. I am 36 and adventurous and I can’t decide if being on a ship with 60-80 year olds for 3 months will fare me well. I won’t be able to climb mountains, go scuba diving or para glide. I will appreciate any advice you can offer. Will I be the only solo 30 soemthing year old on the ship? Maybe I can learn a new language with the free time I have on board. I am all for new experiences and this will definitely be a new experience for me…? That looks like a lot of fun! I can’t imagine what it would be like to spend almost a third of a year sailing around the globe! love you coment ” most of the passengers where rather old” are suggesting that cruises are for the older generation? i am also a fan cruises ( age 40 ),i would want to be classed as old because i like cruises ! o-well just my 2 cents worth . I’m saying they were old because they were. Like I said, the average age on the ship was in the 60’s. I’m not saying everyone who goes on cruises is old, just that the people on this ship and this cruise were. I’m not sure how or why you’d want to read more into it than what I said. Wow, I am jealous! I would love to cruise on a brand new ship – especially the Queen Mary! Extrodainary! I work on a cruise ship myself. Cruise ship travel isn’t for everyone. But I do understand why it appeals especially to the older demographic – it’s a comfortable way to travel. And if you’ve got the money, long term cruising is much better than staying in a nursing home. Had a laugh Gary when you said the people aboard the ship were rather old. Brought back a few memories of when I took a cruise aboard the QE2 a few years back, as it was sailing through the Panama Canal (something I’ve always wanted to see). For someone like myself (used to many a hard mile traveling overland) It was a bizarre way to travel. I’m not one to judge people who drift around the world in this manner, and I wouldn’t say the QE2 cruise will be the last time I ever board a cruise ship. I suppose it’s just different, and I don’t believe people can judge it unless they’ve tried it. That said, I find overland travel a much more rewarding experience. The again, most people aboard a cruise ship’s are mainly after a bit of R and R I suppose. I would like cruising a lot more if you could spend more time in port. If you could get off the ship and stay in town for a week and get on the next ship, I’d seriously consider it as a means of transportation. Cruise ships in the 21st century aren’t really transportation. They are destinations in and of themselves. I would like to take a ship from London to New York someday. I think it would be interesting to sail into New York Harbor. I, too, would like make the transatlantic crossing and sail into New York harbor one day on one of the classic liners. A little snapshot of history, I guess. If there is enough demand for that type of travel (where you spend more time at port), I am sure the companies will provide it. (Laws of supply and demand, no?) I would certainly love to travel in that fashion, where you get off one ship and get on another. It would be the best way to meet the most people and have the richest experience. A hop on/hop off cruise ship sounds like a great idea actually! While cruising isn’t typical transportation for backpackers, we were able to take a repositioning cruise from Rio de Janeiro to Rome, Italy a few weeks ago — and it cost about one-third the price of a plane ticket. It took two weeks to make the crossing, but we had all our meals, transportation, and entertainment taken care of. Plus we got to stop in northern Brazil and the Canary Islands. It was such a great deal, we’re thinking of booking another one to get back to the States in the fall. I’ve traveled on two segments of a Regent world cruise (700 passengers) – LA to Hong Kong for 42 days. Usually on these types of longer voyages the cruise company goes to extra lengths to make the itinerary and time onboard extra special. Famous expert lecturers and unusual shore excursions are the norm. Those who sign up for the entire world cruise are offered special amenities and activities that are not available to the segment passengers. From my observations, there is a core group of world cruisers who sign up every year. They tend to be elderly and don’t care if they ever get off the ship. It’s more like a winter home to them. However, other full world cruise passengers are in their 50’s and 60’s and are extremely active. Often times the cruise line will offer chances to take 2 or 3-day side trips from the ship, for instance visiting the terra cotta warriors in China while cruising in the area. My longest cruise was 52 days Vancouver to Singapore. It was a bit too long for me, which was surprising since I enjoy small ship cruising. Perhaps if I hadn’t been maintaining a blog, I wouldn’t have minded. Also, unlimited alcohol plus eating rich meals for that many days takes its toll on the body. Will I ever go on a full world cruise? I hope so. But like you, I’ll wait until I’m a little older. Of 38 stops, about a third are in developed, Anglophone countries. Getting off for a few hours to see a fraction of a place not too different to home is a fairly futile way of ‘seeing the world’, don’t you think? I’d love it if a cruise company could make travelling by ship a viable way for long term travellers to get around the planet, but climbing aboard the Queen Elizabeth isn’t the answer. So, you are saying 2/3 of the stops are not in developed, Anglophone countries?? Or the vast majority. Are you saying that you can NEVER visit developed countries? Last I checked, those places are part of the world too. I don’t think you can dismiss a place just because it isn’t some exotic place for western backpackers. Also, most developed countries are landlocked or don’t have facilities for ships to dock. I am a big believer that any travel is better than no travel. Just because something isn’t my cup of tea doesn’t mean I’m going to dismiss it and look down on everyone who travels different than me. A lot to respond to there. First, when you say “most developed countries are landlocked or don’t have facilities for ships to dock,” I think you mean most developing countries. I’m not sure how true that is anyway. I don’t think any part of the world should be ignored, and it being “some exotic place for western backpackers” is definitely not how I decide whether I want to visit a place next – because I too would like to go eveywhere – or not. I am saying that filling one third of an itinerary that literally takes you around the world with developed, Anglophone countries is a little uninspiring, especially when these countries are such a tiny percentage of the world’s total. I’m also not sure that any travel is better than no travel. It’s quite possible to go around the world seeing only enough of it to confirm your prejudices. I do think that the cruises Donna described, which offer lectures and unusual excursions guided by experts, have some value. These are particularly popular in the Mediterranean, I’ve heard, where the cruise ships visit the classical world’s sites with archaeologists and classicists in tow. And I, like you, would consider cruises a better option if you could spend longer in port. Again, I think this is being done in the Mediterranean, with hop on, hop off ships targeted at budget travellers. The combination gone global would be exciting. You can confirm your prejudices anywhere if that is what you set out to do. I’ve seen it. Again, I’m not saying that spending 8 hours in each port is the ideal way to see the world. But if my mother, who has never traveled anywhere, wanted to go around the world, I’d suggest this as one of her options.